I am a lover of all things pumpkin. How about you? Especially when we are talking about healthy pumpkin recipes. These Iced Pumpkin Cookies are made healthier. You would never guess by the taste. These remind of those sinful soft batch cookies from the grocery store. You know the kind I am talking about, right? Back in the day, I could inhale a lot of those!! 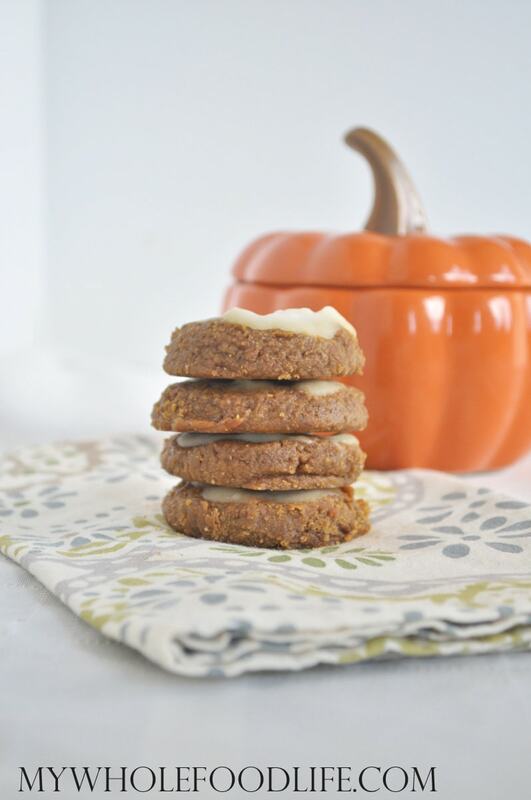 This is my healthier, pumpkin version of those cookies. I hope you enjoy them as well. These cookies are vegan, gluten free and even paleo approved! All you need is a few simple ingredients. I made my own cashew butter for this recipe. Here is a quick video on how to make it. Super easy. Pumpkin spice cookies with a sweet glaze! In a food processor , combine all the cookie ingredients. Blend until smooth. Once the cookies are done, place them in the fridge to cool while you make the icing. To make the icing, combine all the ingredients in a small blender or food processor. I used the twister jar for my Blendtec . Spoon icing over each cookie and them place in the fridge to firm up. Should take 5 minutes or so. Store these cookies in the fridge. They should last a couple weeks. Enjoy! These sound so good! It just started to cool down where I live so I'm ready for fall and all the good flavors that come with it, like pumpkin. These cookies sound perfect! I am not sure. I don't see why not though. If you try, let me know the results. These sound really good. Can you substitute almond butter for the cashew butter? I'm allergic to cashews, unfortunately. Thank you. Thank you! I think you could. These cookies look delicious. Where is the best place to buy coconut butter? When you make your cashew butter are you using raw cashews? And if so, soaked? Don't soak nuts when making nut butter or it will turn rancid in a few days. It probably wouldn't matter for the cookies though, since you are baking them. You can use raw or roasted nuts but I believe most of Melissa's recipes are tested with raw. I never soak my nuts for nut butters. Only for nut milk. I always use raw nuts in these kinds of recipes. I am definitely making these this week! They sound so good! Thanks Robin! I hope you enjoy the recipe! I made these tonight and they are to die for! I love the icing so much, so simple and easy! I added some chopped almonds and raisins too! These look delicious but we have a serious nut allergy in our house. Any recommendations for a healthy swap to the cashew butter? Can I use store bought cashew butter? I bought creamy salted cashew butter in trader joes. Ingredients are dry roasted cashews, sunflower oil, sea salt and less than 1% dry roasted almonds. I can't wait to try this!!!!! Now I know what I am doing this weekend!